Citation EUPHORBIA PERGAMENA Small, Bull. Torrey Bot. Club 25: 615. 1898. 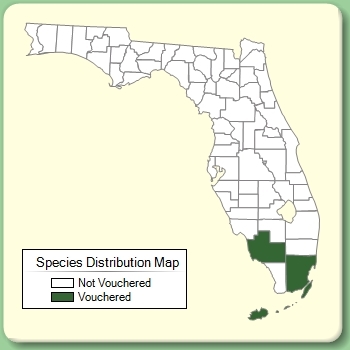 Chamaesyce adenoptera subsp. pergamena Chamaesyce adenoptera (Bertoloni) Small, subsp. pergamena (Small) D. G. Burch, Ann. Missouri Bot. Gard. 53: 98. 1966. BASIONYM: Euphorbia pergamena Small 1898. 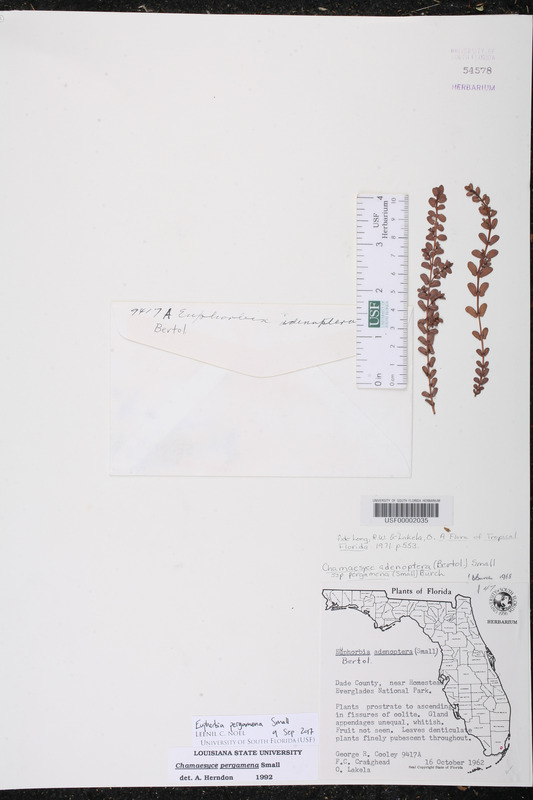 Chamaesyce gymnadenia Chamaesyce gymnadenia (Urban) Millspaugh, Publ. Field Mus. Nat. Hist., Bot. Ser. 2: 409. 1916. BASIONYM: Euphorbia gymnadenia Urban 1908. 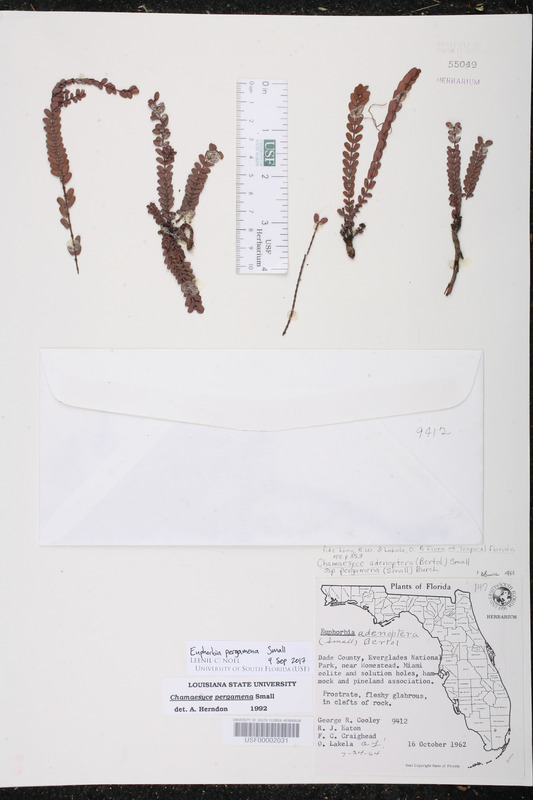 Chamaesyce monensis Chamaesyce monensis Millspaugh, Publ. Field Mus. Nat. Hist., Bot. Ser. 2: 389. 1914. TYPE: PUERTO RICO: Mona Island, 20-26 Feb 1914, Britton et al. 1841 (holotype: F; isotype: NY). Euphorbia adenoptera subsp. pergamena Euphorbia adenoptera Bertoloni, subsp. pergamena (Small) Oudejans, Phytologia 67: 44. 1989. BASIONYM: Euphorbia pergamena Small 1898. Euphorbia gymnadenia Euphorbia gymnadenia Urban, Symb. Antill. 5: 390. 1908. 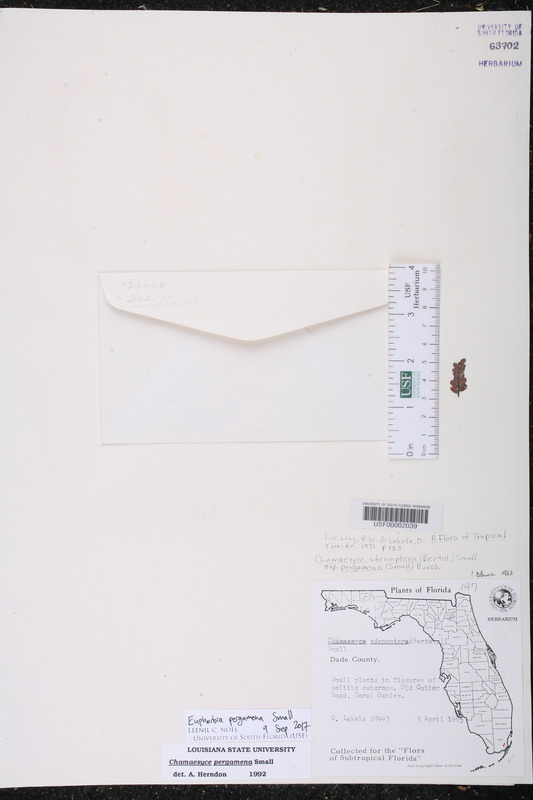 TYPE: CUBA: Without data, Wright 3706 (holotype: ? ).